Reference 3 offers a truly effective route to improved speaker and headphone clarity, and it's also brilliantly simple to use. Room calibration is very easy. Clear graphical feedback for processes. Useful Calibrate options. Good selection of headphones covered. Plenty of trial and purchase options. No speaker/headphone bundle. Minimum-phase filter mode is CPU-heavy. 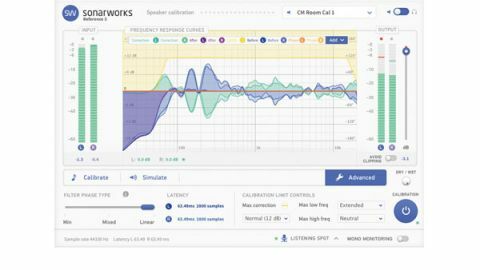 Latvian developer Sonarworks has updated Reference, its room analysis and correction package. Reference 3 is now fully Mac compatible, with the analysis application and correction plugin (VST/AU/RTAS/AAX) both available for OS X. Previously, the analysis software was PC-only, so Mac users had to copy an analysis file over from a PC for use with the plugin. Ironically, Reference 3 for PC isn't yet available, though we understand it's on the way. Finally - and this is a biggie - version 3 also includes a headphone calibration version. "The calibration process is partly automated - it took about 20 minutes"
Before you get too excited, Reference 3 (the speaker version) and Reference 3 Headphones (the headphone version) are currently two separate purchases (although they share the same plugin), and while there are many ways to buy/demo them, there's no bundle on offer yet. To use Reference 3 for speaker calibration, you need the analysis software (Reference 3), a linear measurement microphone, and the correction plugin (Reference 3 plugIn) inserted between your DAW and monitors (on the DAW's main output, for example). When you launch Reference 3, the whole testing process is presented as a simple walkthrough. First, you select a microphone calibration profile (the file for Sonarworks' own XREF 20 mic is included, of course); next, you set up your interface: inputs, outputs and playback volume, using the onboard voice playback file. The first set of tests generates measurement data for the distance between the two speakers and your distance from the speakers (these can be edited manually). Then there are 24 positional tests (all taken around the location of your head in its normal listening position). The calibration process is partly automated, as the onscreen graphic indicates where you should put the mic and senses when you've done so; so all you have to do is get the mic into the target area. The process took us about 20 minutes. Once done, you're presented with a plot that you save as a Sonarworks Project file (.SWPROJ) and load into the Reference 3 plugin, which is inserted across your monitor outputs. The plugin shows the blue source plot overlaid with a correction curve (green), target curve (red), output curve (purple), correction limits (yellow) and correction filter phase (orange). Manual adjustments can be made to the correction process. You can influence the Target curve using one of the three Calibrate options: Flat, Custom and Predefined. Flat aims to make the output as flat and neutral as possible; Custom includes two adjustable controls - Bass Boost and high frequency Tilt (cut); and Predefined comprises four home loudspeaker presets ('Large', 'Small', 'All' and 'B&K 1974 optimum Hi-Fi curve'). The Simulate option takes things further, with emulations of six popular speakers and headphones (including NS10 and Beats-style), while the Advanced tab provides three EQ correction curve options: Minimum Phase, Mixed Phase and Linear Phase. "Both plugins do great work, but the speaker option is definitely the most impressive of the two"
Rounding things off are a wet/dry control, mono selector, the Avoid Clipping option (keeping the output level in check), and the ability to deactivate the L/R listening spot timing adjustment (a parameter based on the L/R loudspeaker timing differences established during the analysis process). Initial listening in Flat mode proved quite revelatory. Our test room, although not bad by any means, had clearly been introducing frequency build-up at two specific points in the low mids, and there was also some cancellation at around 70Hz. Applying the correction curve delivered a much more open and flatter sound. Switching through the three filter phase options highlights the heavy CPU hit that comes with the minimum phase setting, as well as the efficiency of the linear phase option (albeit with a longer latency of 60ms). As mentioned in the help menu, we did notice low-frequency pre-ringing in linear mode, but only when monitoring bass-heavy tracks in isolation. Using Reference 3 for headphones is a much simpler process. Simply load the Reference 3 plugin on your monitor output (or whichever output feeds your headphones), activate the Headphone Calibration option at the top right and select the headphone calibration file (.SWHP) to match your cans. You get the very same target curve Calibrate options discussed above (Flat, Custom and Predefined), and the same Simulate options. We tried it with a pair of Sony MDR-7506s (and the Superlux HD661, which is based on the MDR-7506), as well as a pair of Superlux 668Bs (similar to the Beyerdynamic DT990). It felt like the plugin peeled away the nonsense in the headphone response, delivering a much flatter and, arguably, less engaging sound. That's what we need for proper monitoring, though, so job done. Overall, both plugins do great work, but the speaker option is definitely the most impressive of the two, going some way towards resolving room problems in a simple and transparent way. In both cases, if you feel the truth is too much, the Custom Calibrate option gives scope for subtle changes. The Simulate option feels a bit like the odd one out, but we understand Sonarworks are open to suggestions for additional real life simulations. All in all, Reference 3 is an excellent package that really delivers on its promise.